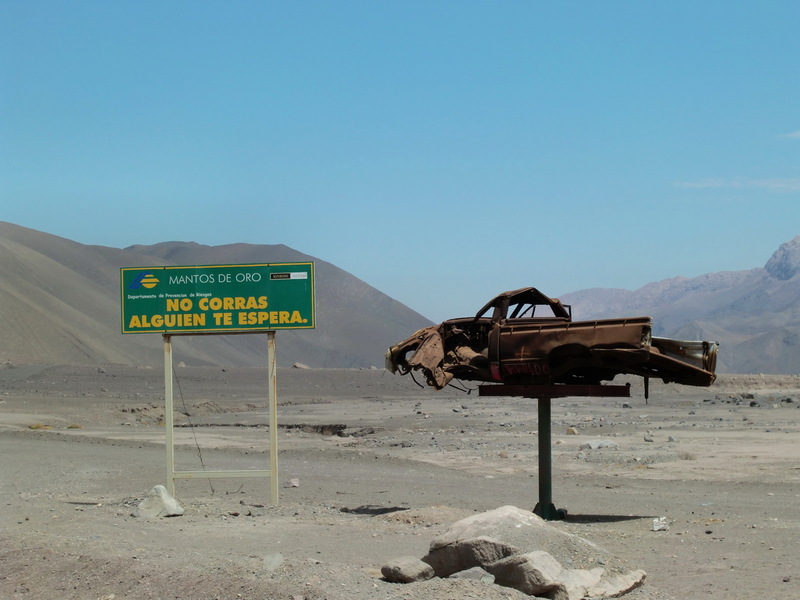 On the way down to Copiapo, we saw some sights which indicate that you are in one of the driest part of the world, the Atacama Desert. 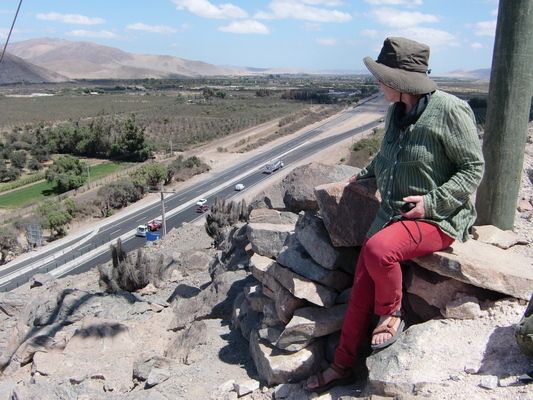 In Copiapo we had to wait two days for the permit, because it is issued in Santiago. But it is free of charge. 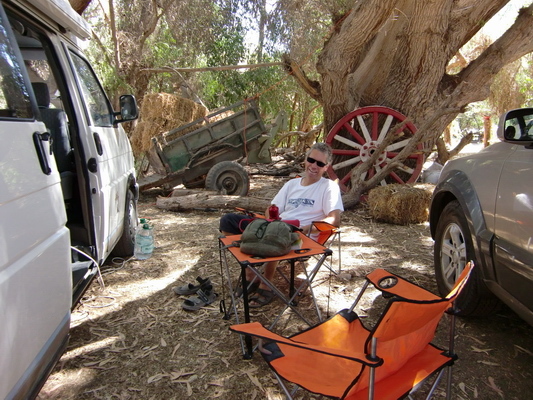 Unfortunately Copiapo has no camping ground, but we found a very nice one 20km West of it, in a farm (including Internet via UTMS). We used the spare day to check the environment of the farm. And we found our first Geo cache including a travel bug in Chile! 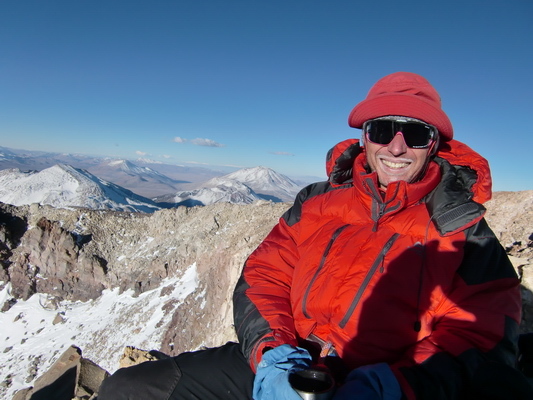 The weather forecast was excellent for the next three days, a lot of sun and no wind even at the summit of Ojos del Salado. But for March 22nd, the fourth day, a weather change was predicted with storm in afternoon. 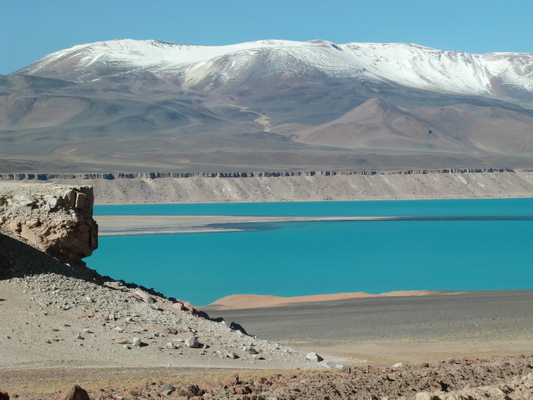 Consequently we had to be fast and we grabbed our permit and drove back to the Laguna Verde. 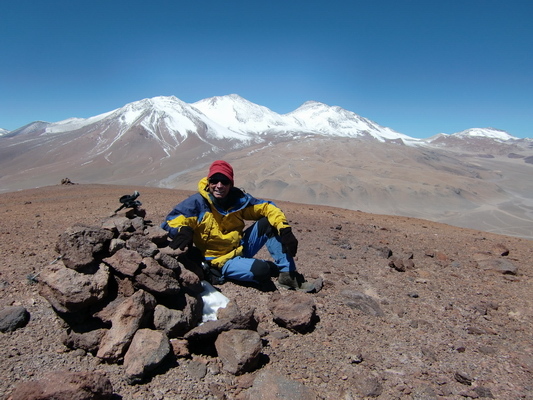 To promote further acclimatization we did a short mountain tour from Portezuelo de Tres Cruzes to Cerro Los Portezuelos, which is with 4852 meters higher than the tallest peaks of the Alps and California (GPS coordinates: S27° 01.674' W68° 54.526'). 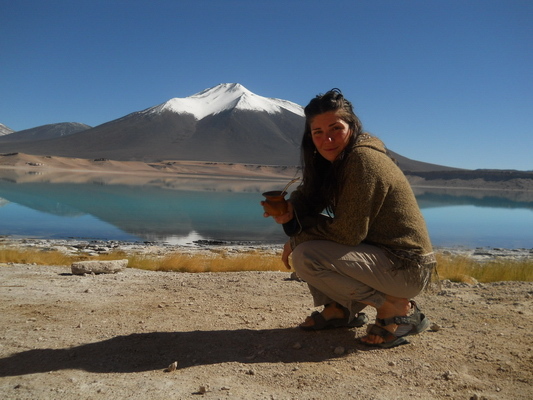 We came back in the late afternoon to Laguna Verde and agreed with Paula that Mario drive us to the Refugio Atacama on the next morning. 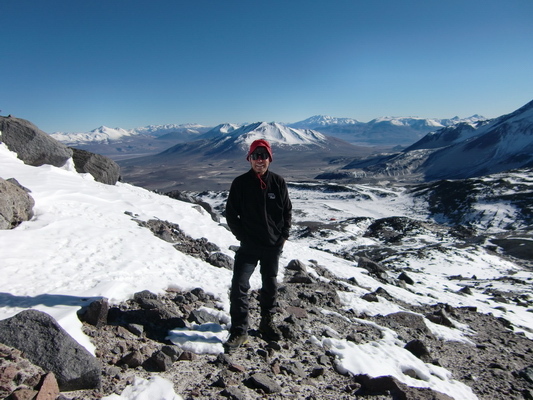 Mario was with a client on Ojos del Salado. It became dark and Mario did not return. 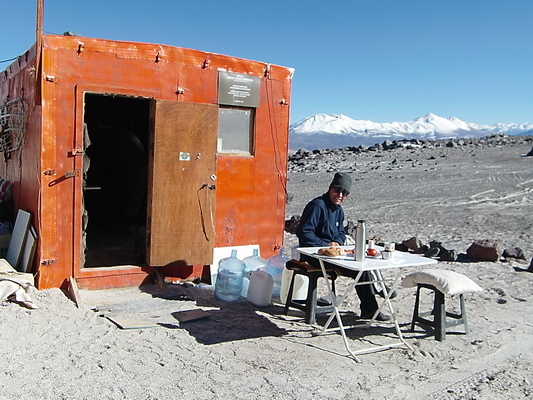 There is a voice radio on the Atacama hut and Mario has also one portable, but no message from him. Paula became very nervous, so we drove with her to the Police station some kilometers in direction border. But the Police disappeared. 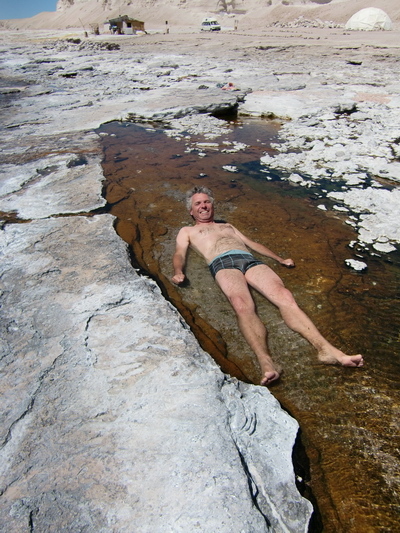 Finally at 11:00PM Mario's voice was on the radio, he had some trouble with his client due to lack of acclimatisation. He came back at 1:00AM; his client was picked up by his friends. We arrived at Refugio Atacama at late afternoon and got some instructions from Mario how to use the voice radio (GPS coordinates: S27° 03.592' W68° 32.865'). Due to battery issues we should use it only in emergency cases. 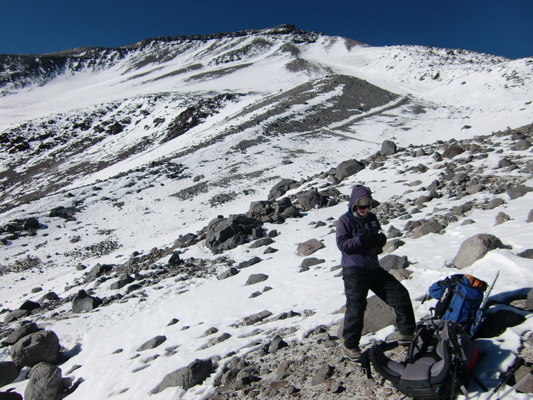 There was still enough time to head to the upper Tejos hut to depose some equipment there. 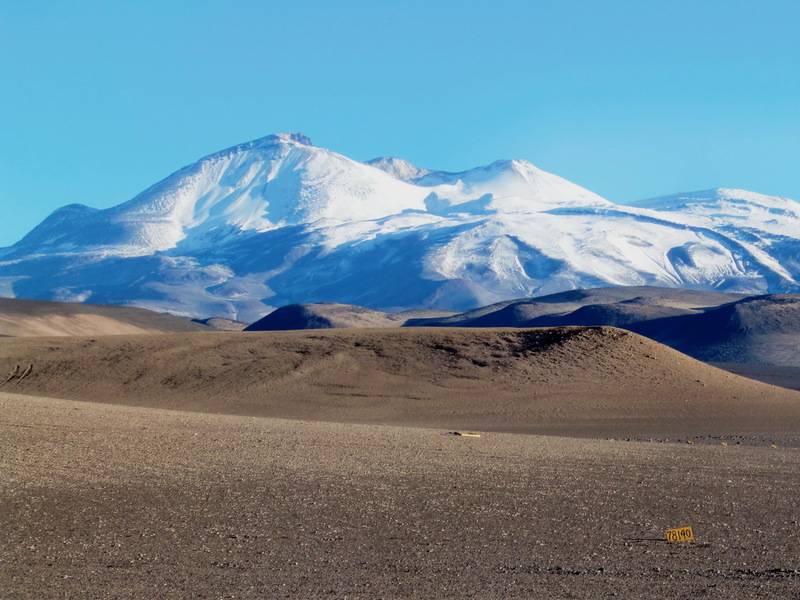 We slept very well at the Atacama hut, which is already 5200 meters high, so we dared to move to the higher Tejos hut (5825 meters, GPS coordinates: S27° 05.261' W68° 32.298'). And we were totally alone on both huts. 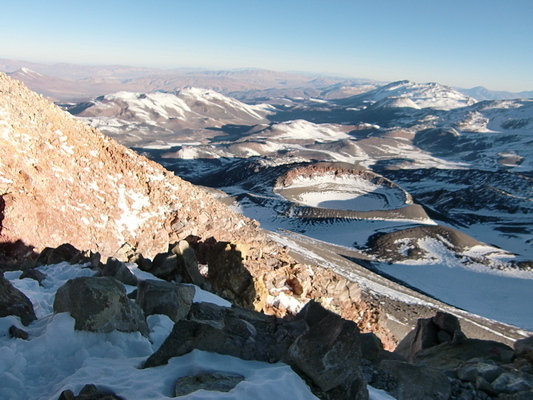 The night on the Tejos hut was a little bit less comfortable, due to the altitude and coldness. 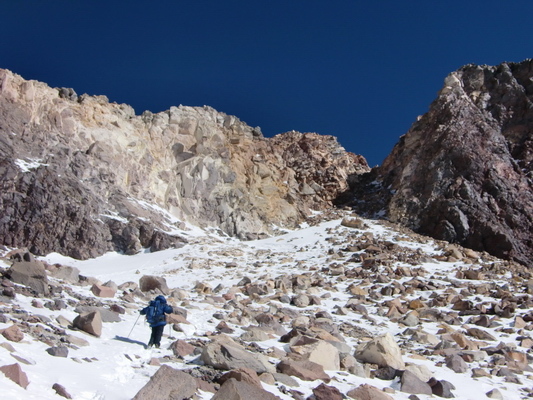 We wake up at 4:00AM on March 21st 2011 and started the ascent to Ojos del Salado. But Marion's feet became so cold that we had to return and to warm the feet with a bottle with hot water. We started again at 8:00AM, when the sun came. 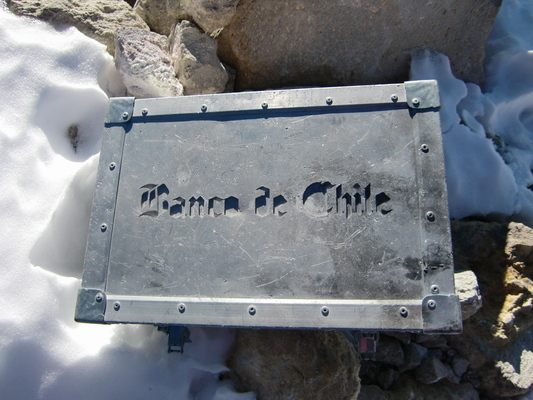 Finally at 6:00PM we arrived at the summit of Ojos del Salado, after 10 hours heavy fighting (GPS coordinates: S27° 06.571' W68° 32.414'). The last hours we had to stop every few meters to breathe and to recover. For us very astonishing was that the climbing was less exhausting than we expected. 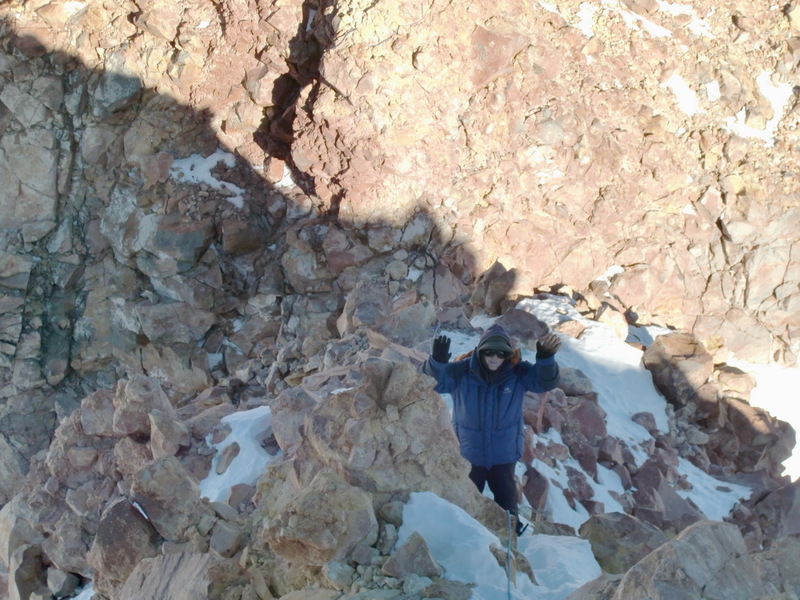 It is not very difficult and there is a fixed rope, but it is very steep and exposed. No false step is allowed. It seemed that our bodies had produced a lot of Adrenaline the last few meters. The view from the top was overwhelming and the weather conditions were unbelievable: No wind and reasonable temperatures at 6893 meters! But our return became very late. Fortunately we were able to cross the critical steps during day light, but darkness felt in at 8:30PM. Suddenly we saw car lights few hundred meters below us. There was no road? Few minutes later we saw a single light heading to us. It was Mario picking us up. We were very happy seeing him and embraced him. Maybe his lesson about the usage of the mobile voice radio had been too strict; we had no emergency case or accident. Together we returned to the four wheel car, where Paula was waiting. We were back at our car on Laguna Verde around midnight, fortunately because the Tejos hut was fully occupied by a bigger French group. Thanks a lot Paula and Mario. We slept very long the next day. 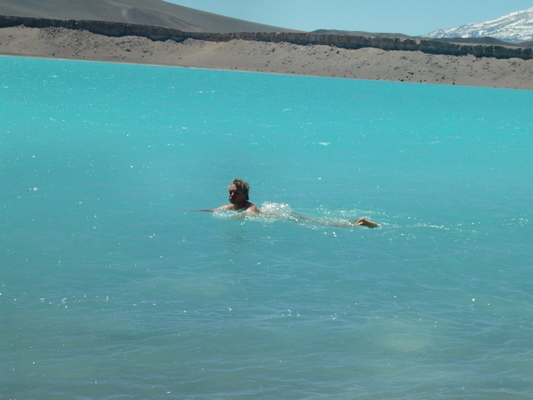 During our breakfast at 1:00PM we saw Paula swimming in Laguna Verde. Of course Alfred had to do the same. After we exchanged our pictures, we sad god bye to Paula and Mario and returned to Copiapo. What to say more after reading this !